In Cronus there is Cronus Queen NPC (391:610) from which player can enter the realm of Boss Descent. There are 15 total types of Bosses. 3 different looks of them where each of them exist in 5 different forms. Forms differ in HP and power that Boss posses! Each Form is signed by number in the Boss name (so just see on name which one spawned for you). Player aim will be to enter Descent and kill as many Bosses as can. 3 Hours timer once enter and 3 map open. Next player enter all bosses will be automatically clear! 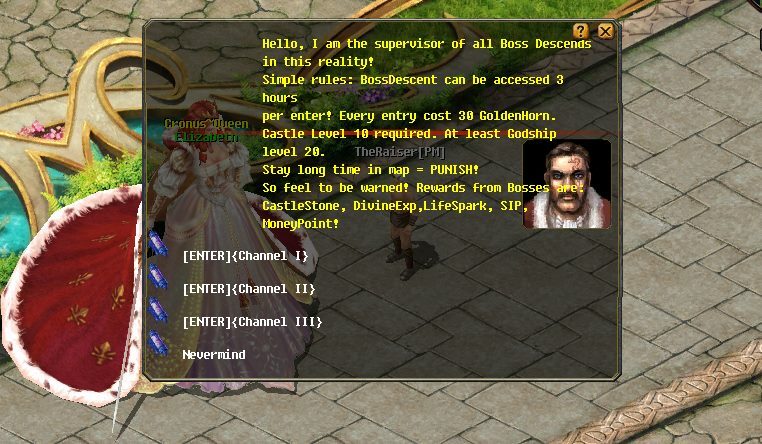 As rewards for every boss killed player receiving CastleStone + DivineExperience + LifeSpark + SIP + MoneyPoint in amounts depending on action factors in the packs bosses. Each Boss killed will calculate total Reward Points and provide proper reward basing on total reward points (Attention: lowest form of Bosses will provide always lowest reward when killed!). 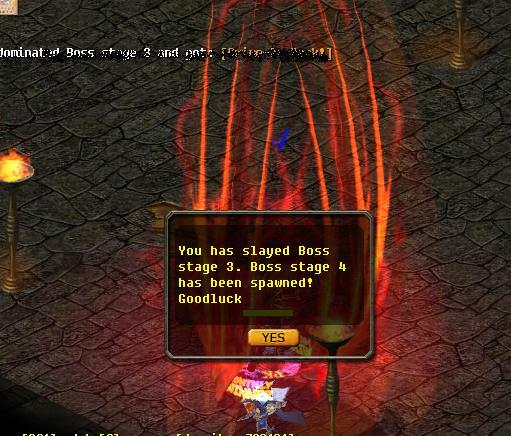 When Boss die reward will be dropped - next boss will spawn automatically. Attention. These settings are for the first beta test of this quest. There could be added in time additional rules or options like for example time limit that player can spend in Descent... Please report about any problems and generally about the hardeness of this quest.